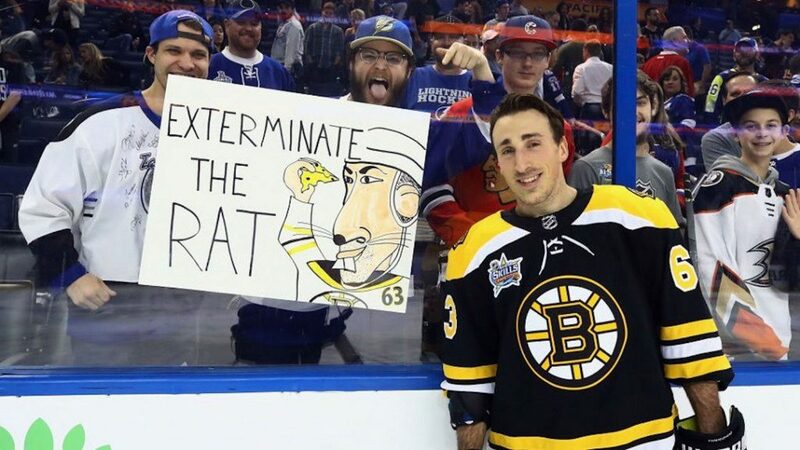 Brad Marchand has been known as “The Rat”, “The Pest,” and “The Little Ball of Hate” throughout his career in Boston. But could next season see the end to the agitator’s antics? On Bruins break up day following their elimination from the Stanley Cup Playoffs, Marchand said he wanted to take steps to improve his reputation. During the five-game defeat to the Tampa Bay Lightning, Marchand was told by the NHL to stop licking the faces of players. Marchand licked players’ faces twice during the postseason – Toronto Maple Leafs Leo Komarov and then Lightning’s Ryan Callahan. Marchand acknowledged that he tends to get out of hand and that it will be a challenge to change the player he is when some of his antics in the past might not have received the same level of surveillance. There is no doubt that Marchand is a great player. The left winger led the team this past season with 34 goals and 51 assists for 85 points on the regular season. For the past four seasons, Marchand led the team in one of the three statistics, but there is one statistic that Marchand should be focusing on for the upcoming season—penalty minutes. Looking back at the 2014-2015 season, Marchand recorded 95 penalty minutes while only recording 42 points. However, as Marchand’s point totals continue to climb, his penalty minutes have seen an impressive decrease. Marchand has decreased his time spent in the penalty to box from 95 penalty minutes during the 2014-2015 season to 63 penalty minutes along with 85 points in the 2017-18 season. Impressively, the top line for the Bruins this past season took the top three spots for point totals —David Pastrnak had 80 points while Patrice Bergeron had 63. Not only did Marchand lead the trio in points, but he also led them in penalties in minutes—63 compared to Pastrnak’s 37 and Bergeron’s 26. If Marchand does actually stick to his word and “clean up” his act, then there is no doubt that the first line for the Bruins could be the most dominant line in the NHL. One comment on "Marchand Aims to Clean up Act"